at-Brescia" jinx. 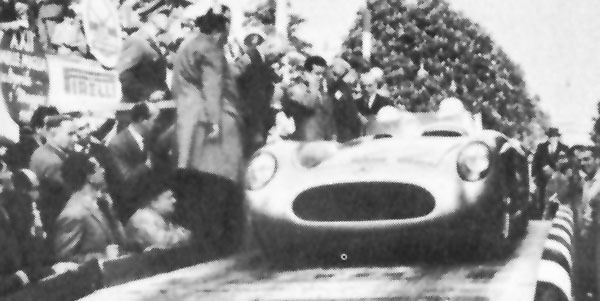 His achievement was all the more remarkable because, according to the Mercedes team strategy as conceived by Manager Neubauer, Moss was not really supposed to win; his task was to set a blistering opening pace to draw out and burn up the Ferraris at the possible sacrifice of his own car, so that team mates Fangio, Kling and Herrmann would have a clear field. Moss set the pace well enough, but car and driver held up all the way, and, except for a few dents from a straw-bale encounter, reached the finish in fine condition. At Brescia before the race, all the elements indicated a great event. Instead of the usual spring rains the weather was hot and clear. With the notable exception of Farina, Ascari, Villoresi, and Behra, most of Europe's top drivers were on hand, and the turn-out of cars - some of them making their racing debut - was the most impressive ever. Out of 648 entries, 533 appeared at the starting line, running in 13 classes ranging from the new category for Diesel cars to the Unlimited Sports class. In the latter, the biggest battle was obviously to be between Mercedes-Benz and Ferrari. The German team was opposed by Ferrari drivers Taruffi, Maglioli, Marzotto, and Siginolfi in the 3.75litre, 6-cylinder cars, and Castellotti in the new. un-raced 4.4 - litre 6. No works Lancias appeared, but a 3-litre, 6-cyl. Maserati was on hand driven by Perdisa and also a 3-litre Gordini. The strongest British entry was Collins' Aston.Martin DB3S, but also running in the big-car class were four Austin-Healey l00S models piloted by Donald Healey, Macklin, Abecassis and Flockhart. Gran Turismo competition was provided by three Mercedes 300 SL's (one of them driven by John Fitch), Aston-Martin DB2-4's, Jaguars and a host of smaller cars. Around the starting ramp Saturday evening, excitement was at a fever pitch. At 9:00 pm ,the first car, a Diesel-engined Fiat, made its start, to be followed off the mark at one-minute intervals for over ten hours by a steady procession' of cars with ever-increasing engine displacement. Not until 7 :28 A M Sunday did the last of the big cars rumble off and by then some of the small ones were already past Rome, nearly 600 miles away. 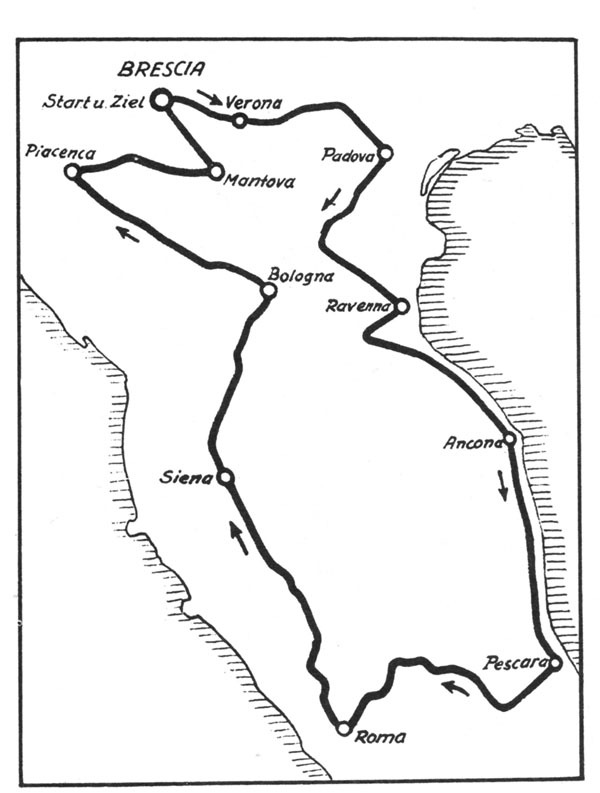 The 992-mile circuit of the Mille Miglia is shaped like ~ fat bunny with a prominent Adam's apple (at Ravenna), and encounters in its course just about every kind of driving condition. Leaving Brescia, the road leads eastward across the Lombardy plain to Verona and Padua, then turns south across the Po River Valley to Ferrara and Ravena. Along the Adriatic coast are long open straights leading to Ancona and, far to the south, Pescara; swinging west from the sea, the course winds through the Abruzzi mOlmtains to Rome, then starts the long return northward over the plains to Sienna, up through the tortuous hairpins of the Apennines and the futa Pass, down through Piacenza and Cremona, crossing the Po again to pass through Mantua (Nuvolari's home), and so over the flatlands to Brescia once more. 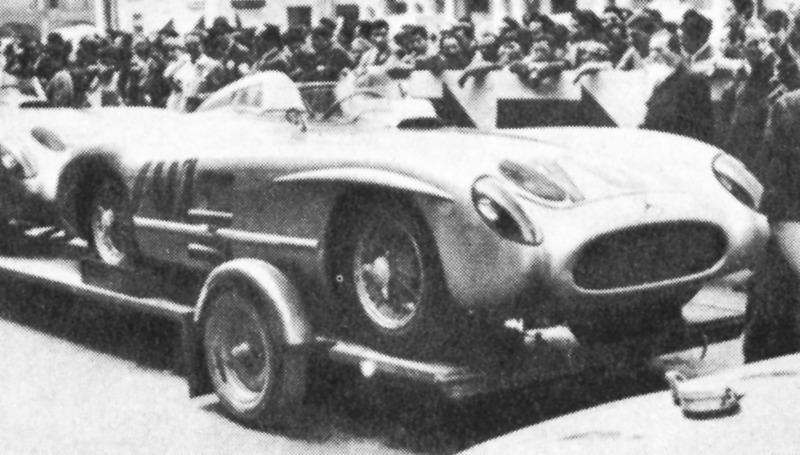 Unlike the Pan American race, which,though twice as long, is made up of relatively short hops, the Mille Miglia is continuous driving, with stops only for gas and rally-like "book-stampings" at control points. The road is closed until the last of the big cars are past, but the way is dotted with towns and villages and virtually impossible to police effectively, so the italian fauna, animal and human, is an ever present danger. With ideal driving weather, cars of all classes turned in astounding times to Verona, 42 miles away. 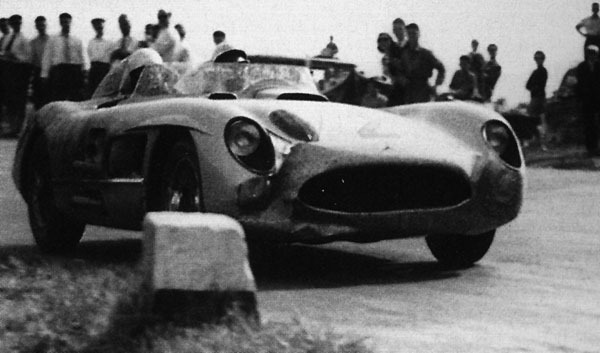 The Ferraris were the fastest with Marzotto's car averaging an unbelievable 122.7 mph. First control was at Ravenna, 188 miles, and Castallotti in the 4.4 Ferrari 6 arrived with the best average, a stunning 119 mph; Moss was almost two minutes slower, followed (in eIapsed time, that is) by Taruffi, Herrmann, Kling, Maglioli, Perdisa, and Fangio whose engine was running roughly. Marzotto was out with a thrown tread and damaged shocks. Heading south, trouble beset the Aston Martins: Collins' DB3S also threw a tread and soon went out with engine failure, while two DB2-4's suffered clutch trouble and retired. 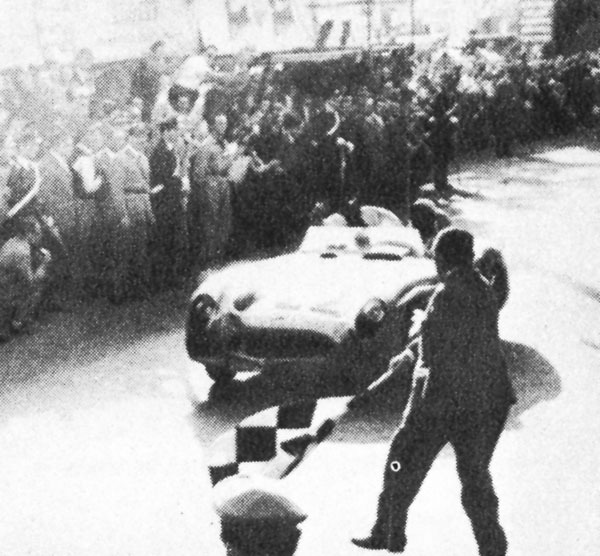 At Ancona; Moss moved into the lead by a scant half minute, but on the coast road to Pescara, Taruffi edged ahead by 15 secs. The "Silver Fox" had a psychological advantage because, starting last, he could learn at each control where he stood in relation to his adversaries; but now he was holding off the German cars almost singlehanded. The pace finally took its toll on Castellotti's big Ferrari, forcing it out with engine failure. Just short of Rome, Kling,who had driven thotlSands of miles on the course in practice, nudged an embankment and crashed, escaping with broken ribs. At Rome, the crucial half-way point, Moss was again ahead by almost two minutes, and the superstitious shook their heads knowingly. 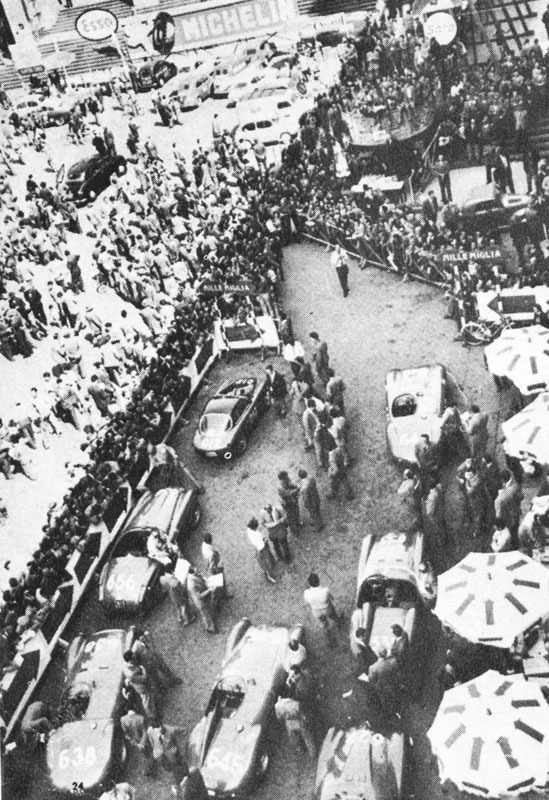 Behind the Englishman in time were Taruffi, Herrmann, Fangio, Perdisa, Maglioli, Siginolfi, Giardini (2-litre Maserati), Musso (2-litre Maserati), and Adianonzo (2-litre Ferrari). 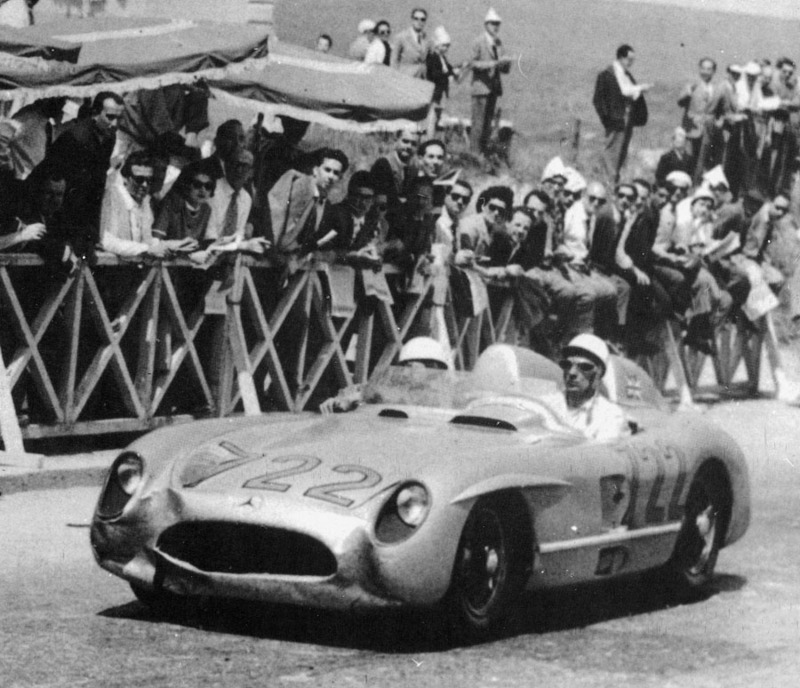 In the 750 cc Sports class, Bayol led (long hours before the big cars arrived) in his D.B., while in the unlimited Gran Turismo class Finch had lost the lead he held at Pescara to Gendebien (300 SL). Two of the A-H 100S's were going strong (Abecassis and Macklin) although Macklin had throttle trouble and was driving on the ignition. Beyond Sienna and into Florence, the three Mercedes of Moss, Herrmann, and Fangio dominated the field, but the latter's engine was still having injector trouble. After one of the most gallant efforts of the race, Taruffi's oil pump failed and he was forced to retire taking with him Ferrari's last hope of winning. 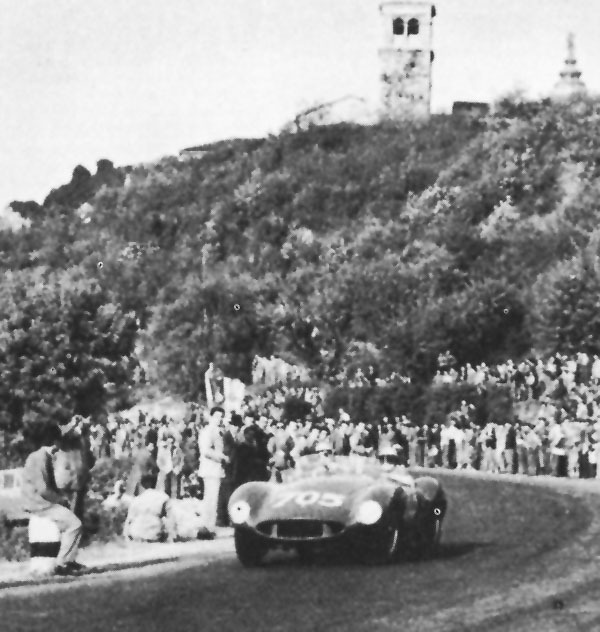 Climbing the dizzying Futa Pass, Herrmann's Mercedes became a casualty with a punctured gas tank, but Moss, passing Bologna with neady a half-hour advantage over Fangio, never eased his pace for a moment. At this point in the route, the D.B. 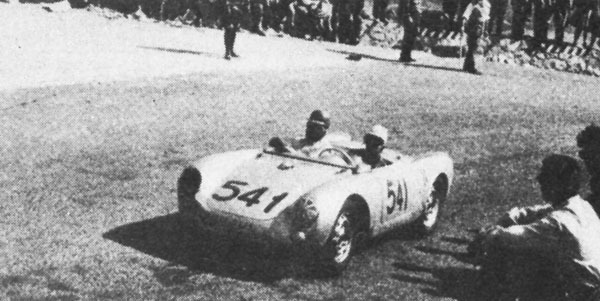 of Storez had overcome Bayors tired car; Porsches led their classes, and Fitch had regained his Class lead. 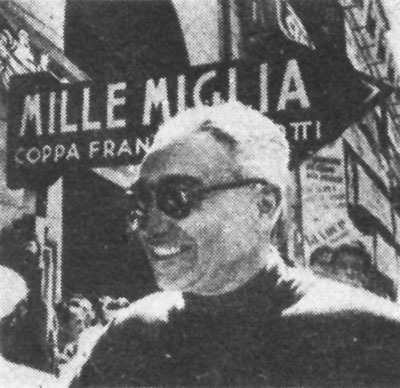 Heading back into Brescia, Maglioli battled to overtake Fangio but missed by 13 minutes, and his lonely teammate, Siginolfi, finished 6th, 40 minutes after Maglioli. 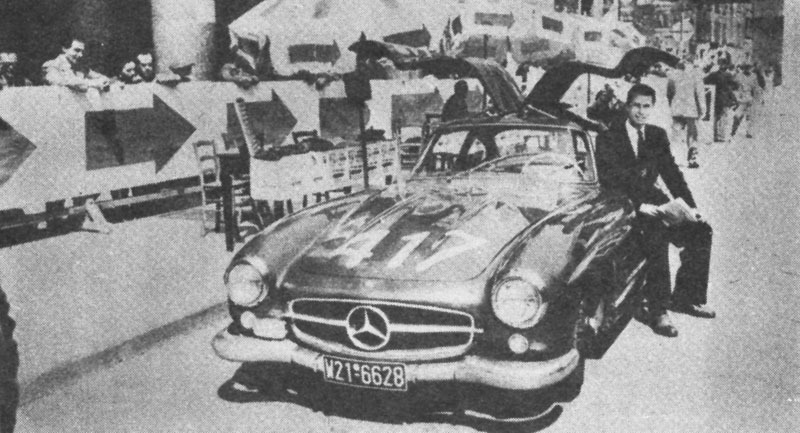 John Fitch drove his 300 SL as no one this side of the Atlantic has ever driven one, and came in 5th overall with a Gran Turismo car! 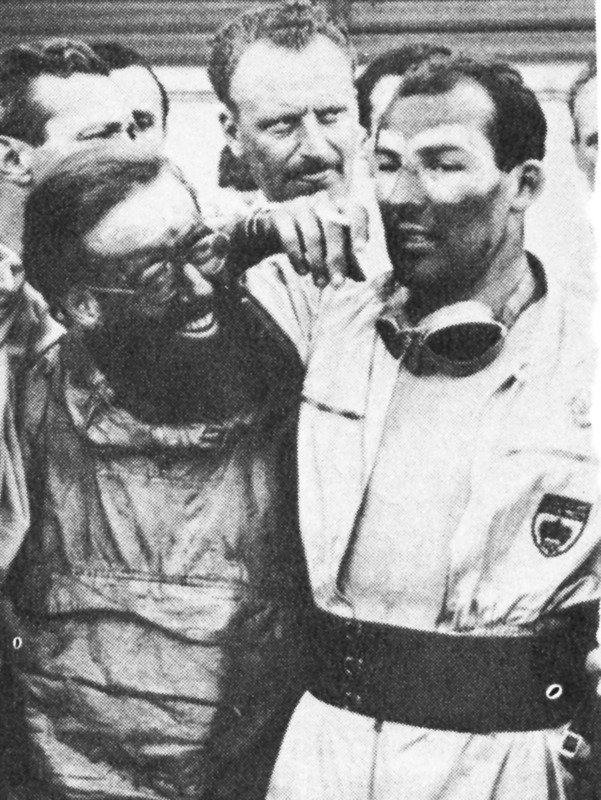 Abescassis placed his A.H l00S 11th overall, and the Triumph TR-2 team, having lost two cars, finished one, driven by Brooke, at the creditable average of. 70 mph. The hum of the silver car as Moss crossed the finish line was lost in a roar of applause. His winning time was 10:07:48, for an average speed of 97.93 mph, a new record and one likely to remain unbroken-for a year or so! All in all, it could be said that the Germans "had a good race": they placed 1-2 in General Category (Mercedes), 1-2-3 in G.T. over 1300 (Mercedes), 1-2-3 in Diese (Mercedes), 1st in 1500 cc Sports (Porsche),1-2 in G.T. 1300 (Porsche). 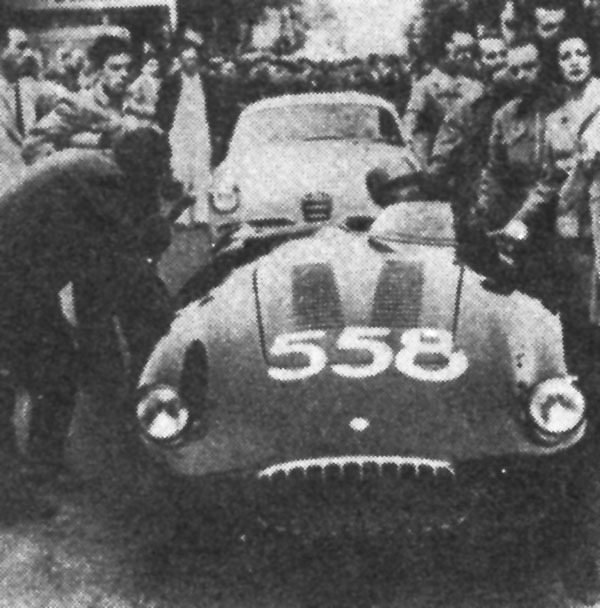 The French won two of the small classes with Renault and D.B., and the Italians took the remaining classes with OSCA, Maserati, Fiat, and Alfa Romeo. The Ferraris were the disappointment of the day, and some say that lack of preparation played a larger part in their downfall than did bad luck. Le Mans is next up, however, and there is still time for a comeback - Moss and Fangio will have the car to beat!